Mansfield Feed Mill is proud to carry Purina horse feeds and supplements. 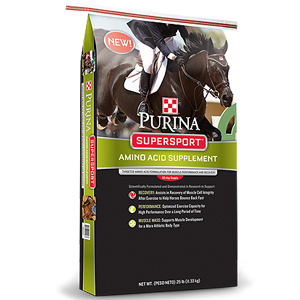 We now carry Purina SuperSport Amino Acid Supplement for horses. This supplement is scientifically proven to support recovery, performance and muscle mass. This supplement is recommended for horses of all ages and lifestyles. Purina SuperSport will help your horse bounce back faster after exercise, increase capacity for a longer and more sustained performance, and help the horse develop muscle.